Creative Market has a great selection of resources, their blog is full of tips and tricks for creating better designs, and the pricing is awesome. I’ve often been able to purchase entire font libraries for much, much less than I would have on other font sites. Designers that put up content for sale are also encouraged to offer free samples or bonuses, and each week there is a selection of Free Goods that you can select from. These might be fonts, Photoshop Actions, images, or vectors. 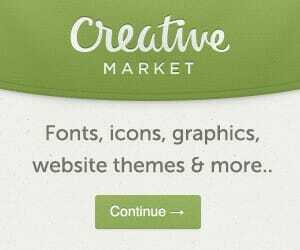 If you’re a designer looking to generate some extra income from your designs, then you also have the option of opening a shop on Creative Market. I encourage you to check them out today (click the image in this post to get there) and start adding to your collection!